Vocal Effort, Load and Fatigue in Virtual Acoustics – Pasquale Bottalico, PhD. Mobile technologies are changing the lives of millions of people around the world. According to the World Health Organization (2014), around 90% of the population worldwide could benefit from the opportunities mobile technologies represent, and at relatively low cost. Moreover, investigations on the use of mobile technology for health has increased in important ways over the last decade. One of the most common applications of mobile technologies on health is self-monitoring. Wearable devices for checking movement in our daily lives are becoming popular. Therefore, if such technology works for monitoring our physical activity, could similar technology be used to monitor the how we use our voice in our daily life? This is particularly important considering that several voice disorders are related to how and where we use our voices. As a first step to answering this question, this study investigated how people talk in a variety of situations which simulate common vocal communication environments. Specifically, the study was designed to better understand how self-reported vocal fatigue is related to objective voice parameters like voice intensity, pitch, and their fluctuation, as well as the duration of the vocal load. This information would allow us to identify trends between the self-perception of vocal fatigue and objective parameters that may quantify it. To this end, we invited 39 college students (18 males and 21 females) to read a text under different “virtual-simulated” acoustic conditions. These conditions were comprised of 3 reverberation times, 2 noise conditions, and 3 auditory feedback levels; for a total of 18 tasks per subject presented in a random order. For each condition, the subjects answered questions addressing their perception of vocal fatigue on a visual analogue scale (Figure1). The experiment was conducted in a quiet, sound isolated booth. We recorded speech samples using an omnidirectional microphone placed at a fixed distance of 30 centimeters from the subject’s mouth. The 18 virtual-simulated acoustic conditions were presented to the participants through headphones which included a real time mix of the participants’ voice with the simulated environment (noise and/or reverberation). Figure 2, presents the measurements setup. 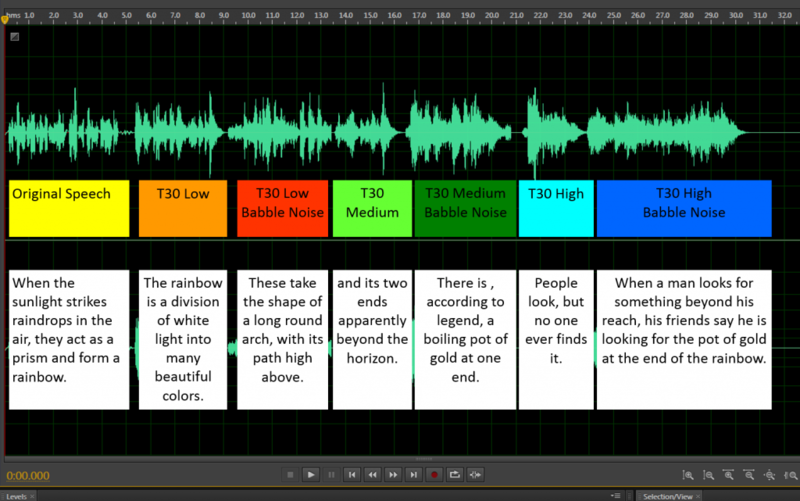 To get a better understanding of the environments, we spliced together segments from the recordings of one subject. This example of the speech material recorded and the feedback that the participants received by the headphones is presented in Figure 3 (and in the attached audio clip). Using these recordings, we investigated how participants’ report of vocal fatigue related with (1) gender, (2) ΔSPL mean (the variation in intensity from the typical voice intensity of each subject), (3) fo (fundamental frequency or pitch), (4) ΔSPL standard deviation (the modulation of the intensity), (5) fo standard deviation (the modulation of the intonation) and (6) the duration of the vocal load (represented by the order of administration of the tasks, which was randomized per subject). As we show in Figure 4, the duration of speaking (vocal load) and the modulation of the speech intensity are the most important factors in the explanation of the vocal fatigue. 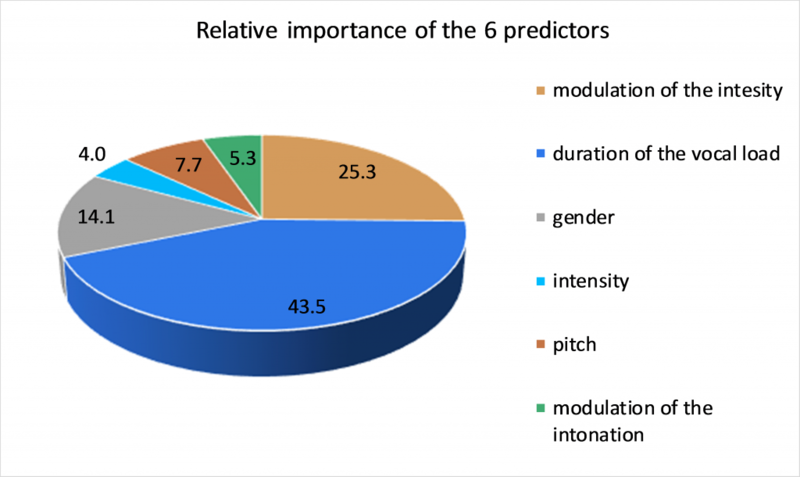 While the results show that participants perception of vocal fatigue increases when the duration of the vocal load, of particular interst are the pitch and modulation of the intonation increase, the association between vocal fatigue and intensity modulation and voice intensity. Specifically, there seems to be a sweet spot or a comfort range of intensity modulation (around 8 dB), that allows a lower level of vocal fatigue. What this means to vocalists is that in continuous speech, vocal fatigue may be decreased by adding longer pauses during the speech and by avoiding excessive increase of voice intensity. Our hypothesis is that this comfort range represents the right amount of modulation to allow vocal rest to the vocal folds, avoiding an excessive increase in voice intensity. The complexity of a participant’s perceived vocal fatigue related to intensity (ΔSPL) and the modulation of the intensity (SPL standard deviation) over the task order, which represents the duration of the vocal load, is shown in Video1 and in Video2 for males and females. The videos illustrate the average values of pitch and modulation of intonation (120 Hz and 20 Hz for males; 186 Hz and 32 Hz for females). If mobile technology is going to be used for people to monitor their daily voice use in different environments, the results of this study provide valuable information needed for the design of mobile technology. 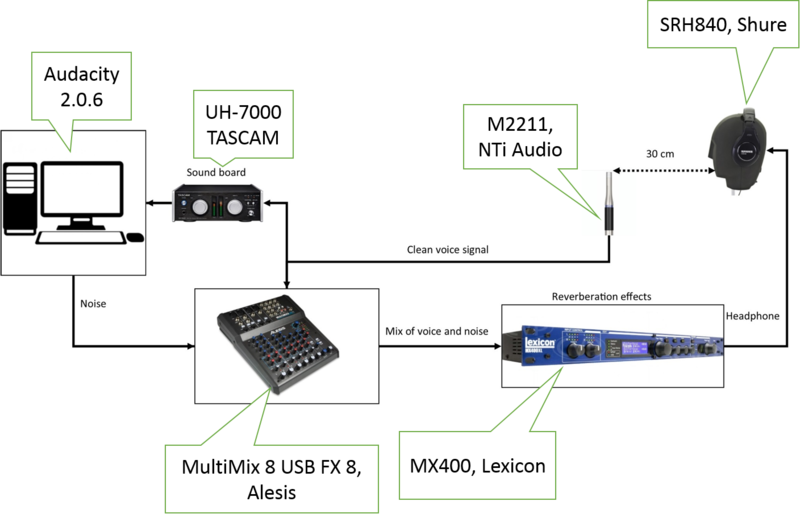 A low cost mobile system with output easy to understand is possible. References1. World Health Organization. (2014). mHealth: New horizons for health through mobile technologies: second global survey on eHealth. 2011. WHO, Geneva.2. Bort-Roig, J., Gilson, N. D., Puig-Ribera, A., Contreras, R. S., & Trost, S. G. (2014). Measuring and influencing physical activity with smartphone technology: a systematic review. Sports Medicine, 44(5), 671-686.AcknowledgementsResearch was in part supported by the NIDCD of the NIH under Award Number R01DC012315. The content is solely the responsibility of the authors and does not necessarily represent the official views of the NIH.